I learned from Growing Home: Stories of Ethnic Gardening by Susan Davis Price that Campanula glomerata is also used as a food source. I had no idea that balloon flower roots were edible. I just wrote a post about them ... I have a shorter variety growing in my garden. The blooms are bigger than on the longer-stemmed versions. I am tempted to uproot one just to see, but they look so beautiful right now that I think I'll resist the temptation. yummm, I get so hungry by just reading about your deluctible garden which is very familiar to my style. I look forward to reading some more. Hi – this is an invitation to join the Garden Bloggers Retro carnival. I don’t know if you’ve ever come across the concept of a Blog carnival – if not I’ve explained it in detail on my site today (Oct 1). But basically the idea is to revive an old post which you think is worth rereading, or which you think new readers might enjoy. Send me the link to the post, and in November I’ll publish a series of posts describing and linking to all the posts people have nominated. I hope you’ll join in and we have a fun carnival! Great to find your lovely blog. In October I spent 5 days at Sooke Harbour House in Sooke, BC. They focus on their organic and edible flowers and plants for all their menu items. On my first morning I took their (free) edible garden tour and learned so much more about the incredible edibles! I've been planning on writing about some of the experiences in my blog ... procrastination ... I'll have to get at it. Again, such a lovely blog, I'll come visit again. Great site! 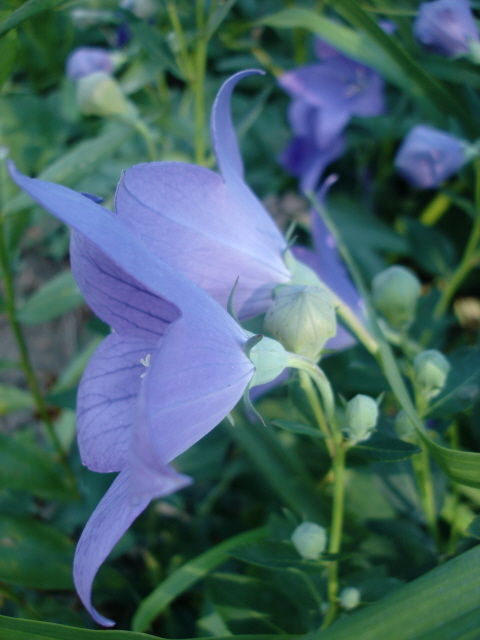 I have a balloon flower I transplanted this summer from my old house to the new (hope it make sit). It always had a few blooms that were marbled purple and white--it was pretty surprising and a joy each summer. I envy your edible garden! My favorite edibles today are the cool season and root veggies I hated as a kid: cabbage, broccoli etc. Once I discovered how delicious they are raw with balsamic vinegar, I never looked back. Hi, just stumbled onto your blog when I was looking up "dyeing your fingernails the Korean way." Love your blog, love your sense of humor. As a 1 1/2 generation Kor-Amer (born in Seoul, immigrated when I was 6), I don't know too many Kor-Amers older than me who I can relate to. (I mean, I love my parents but they just don't know anything about my -Amer side). It was oddly familiar and really nice to read your Korean category blogs. I also see you haven't updated in a while, I hope I can read more soon!